The luxury and gaiety of life in these Edwardian households, each with its army of servants, contrasted sharply with the harshness and poverty that was the lot of so many of the village people. Nevertheless, one cannot ignore the contribution these establishments made to the local economy, both through their patronage of Mitcham tradespeople, and their employment both directly and indirectly of considerable numbers of local people. Neither can one ignore the obvious contentment of the staff at the Cranmers and, indeed, the pride in their work which was felt by many for whom ‘being in service’ could offer a standard of living and security hard to come by in the world outside. 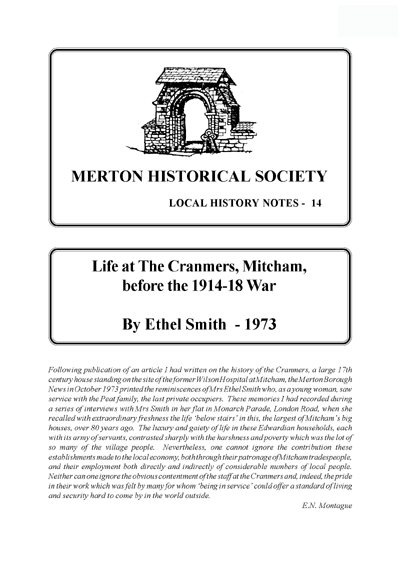 These recollections were first published in the Merton Borough News in October 1973. This entry was posted in Publications, Local History Notes and tagged in lhn.